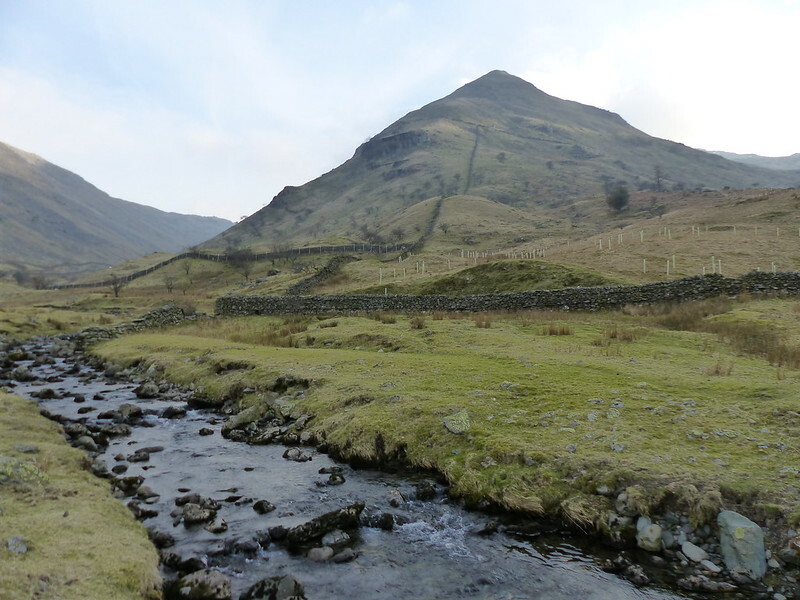 Caiston Beck and Middle Dodd. Ordinarily I’m very unimaginative when ordering photos for my posts – strictly chronological is my one fixed idea, but here’s an exception to prove the rule: this first view was taken near the end of my walk. I’d had the same panorama around 5 hours earlier, but then the sun was hanging directly above Middle Dodd and it seemed a bit pointless taking a photo which would probably have revealed not much more than a silhouette. 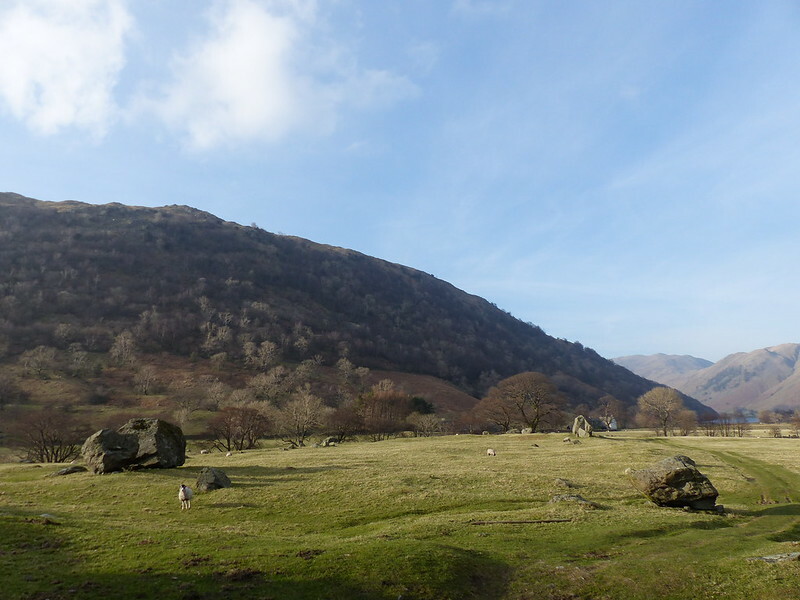 Now I had a different problem – the sun had dropped behind the hills, leaching the colour from the scene. 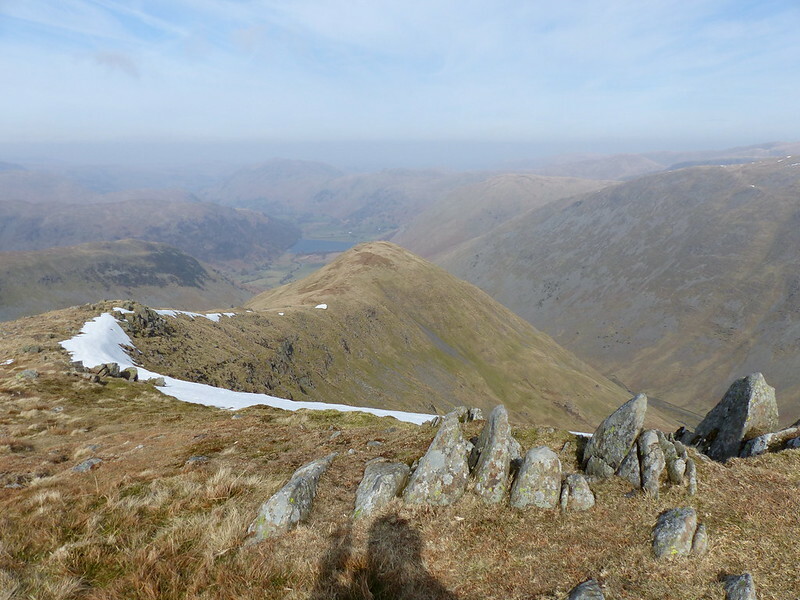 Now that I’ve begun back-to-front, lets continue the Memento – or Time’s Arrow, choose your own cultural reference – style approach: here’s a photo I took a little before the previous one, as I was descending the final steep nose from High Hartsop Dodd. 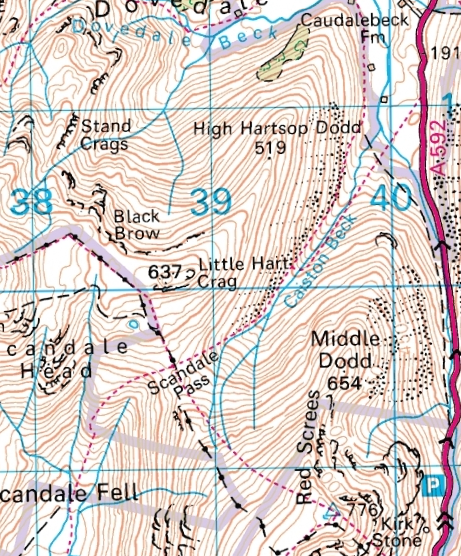 I took it with the intention of showing the route of my earlier ascent, and just how unremittingly steep it had been. 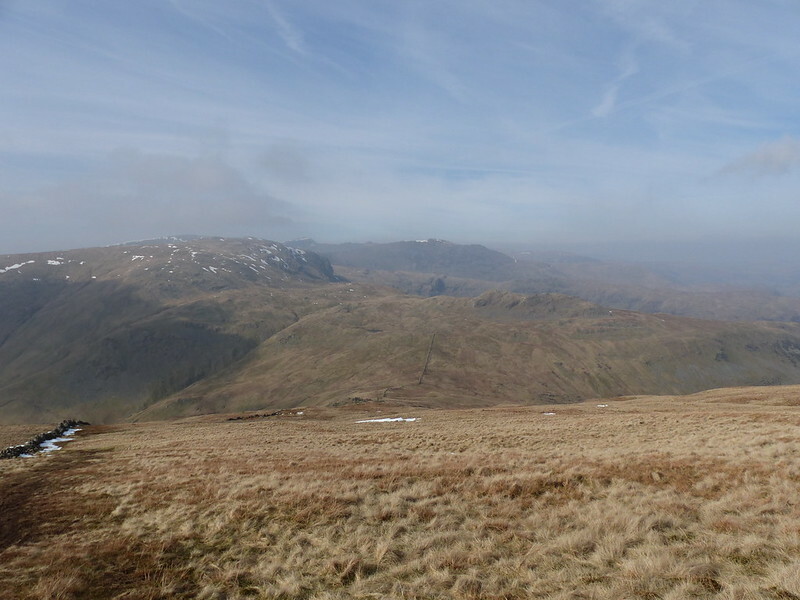 Middle Dodd and Red Screes. 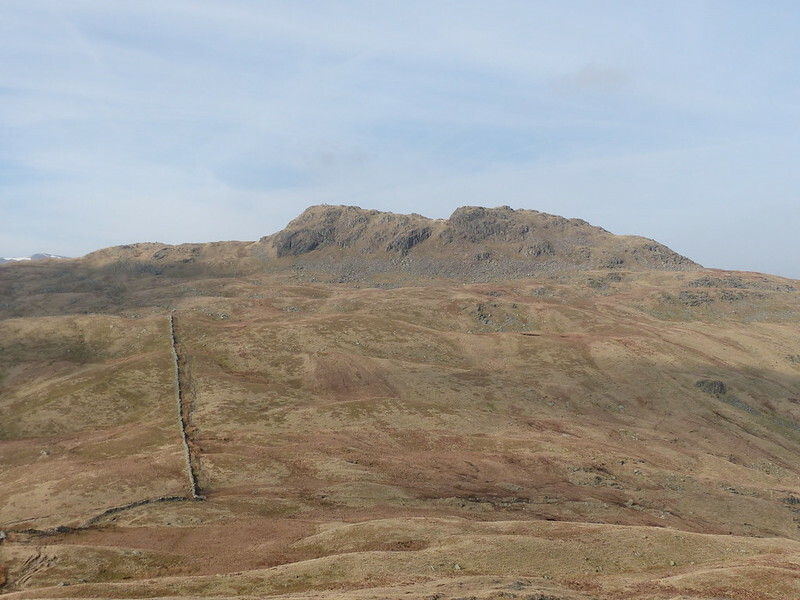 When, after a long steady plod, I’d reached the top of that shoulder a walker beginning a descent by the same route greeted me with: ‘You’re a brave man – climbing all the way up that!’. 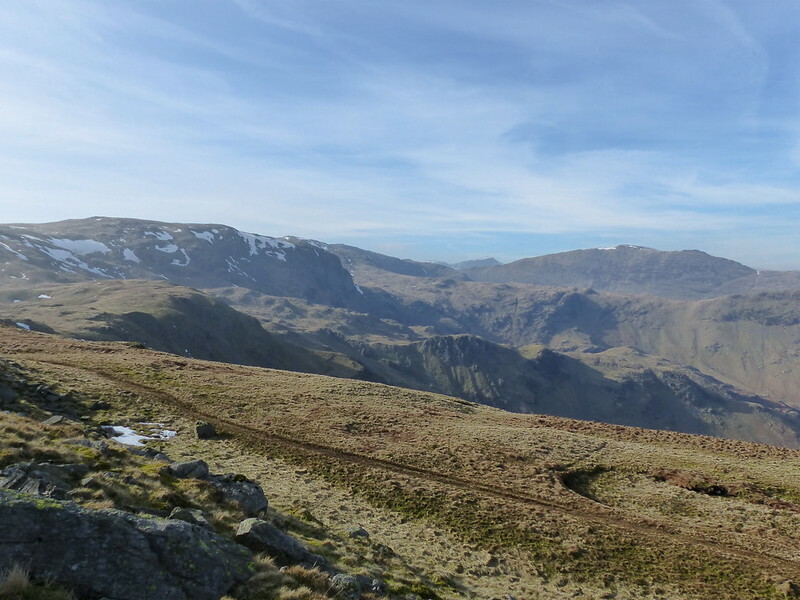 I agreed that it had been hard-work, but added that these days my knees prefer steep ascents to steep descents. In fact, I don’t really mind steep climbs half as much as I used to; I think its because any illusions I might once have harboured that I can climb hills with any speed have long since been dispelled; in fact I have a modus operandi which I use on almost all slopes: I count steps. 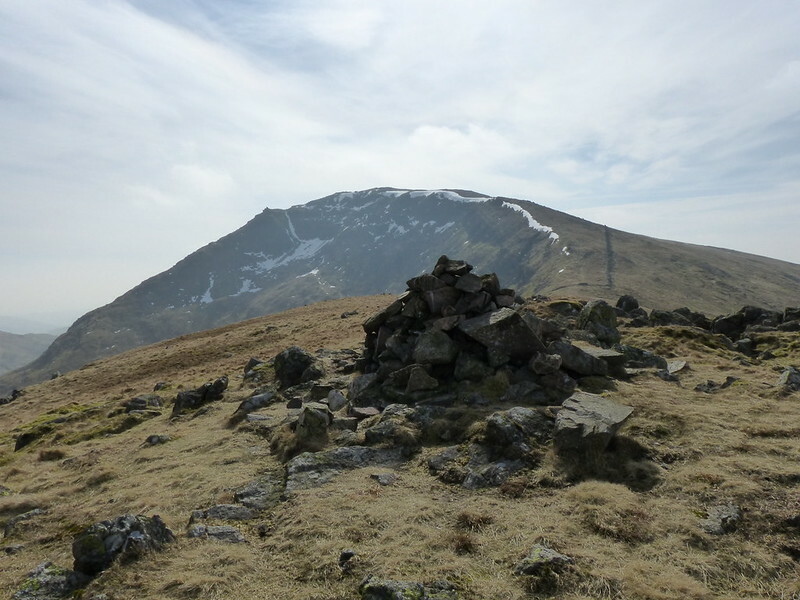 Regular readers will be wondering why it is that I started late enough in the day for the sun to already be well above Middle Dodd, given my penchant for an Alpine start. The fact is, this was an unscheduled escape: B should have been playing rugby, in which case I would have been on the touchline cheering him on, but he’d come down with a heavy cold and decided that he wasn’t up to it, so I made a late decision to head for the hills when the opportunity beckoned. 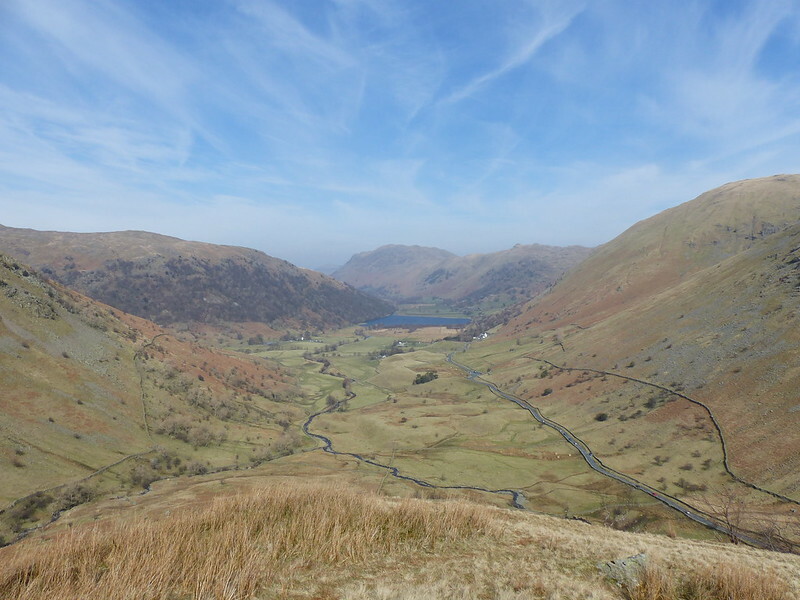 So it was that I pulled into the layby close to the bottom of the Patterdale side of the Kirkstone Pass at well after eleven. I was quite surprised to find a space at that time, but there were several – probably a good indicator of the unpopularity of my chosen route of ascent. 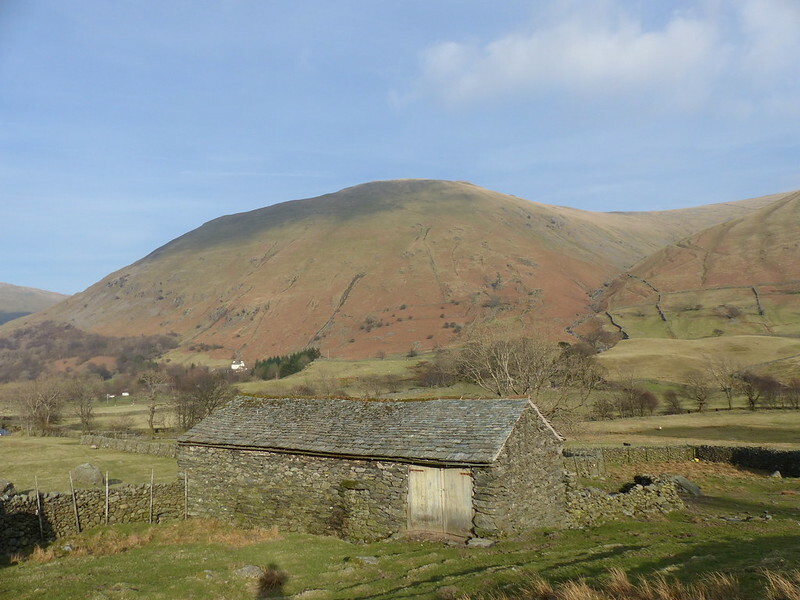 Another couple of walkers set-off just after me and we leap-frogged each other a few times as we enjoyed the burgeoning vistas gifted by the rapid rise from the valley. 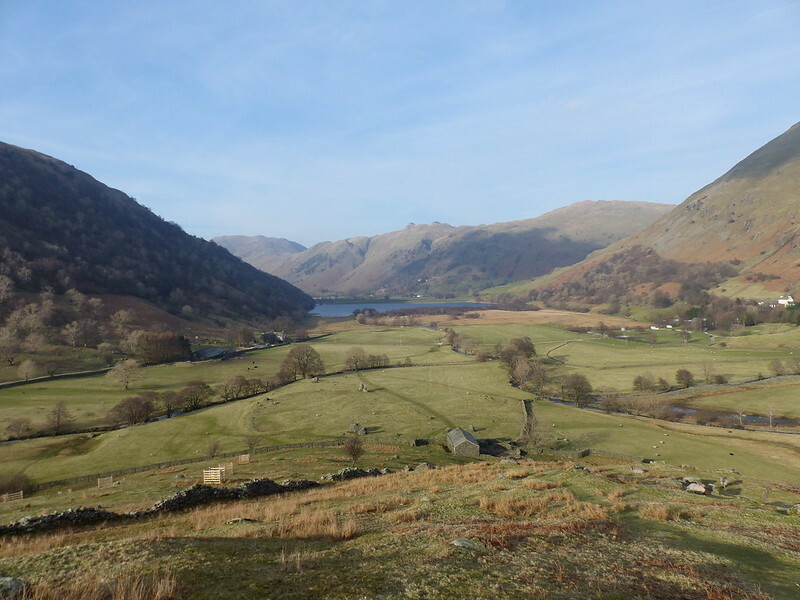 Brothers Water – Place Fell behind. 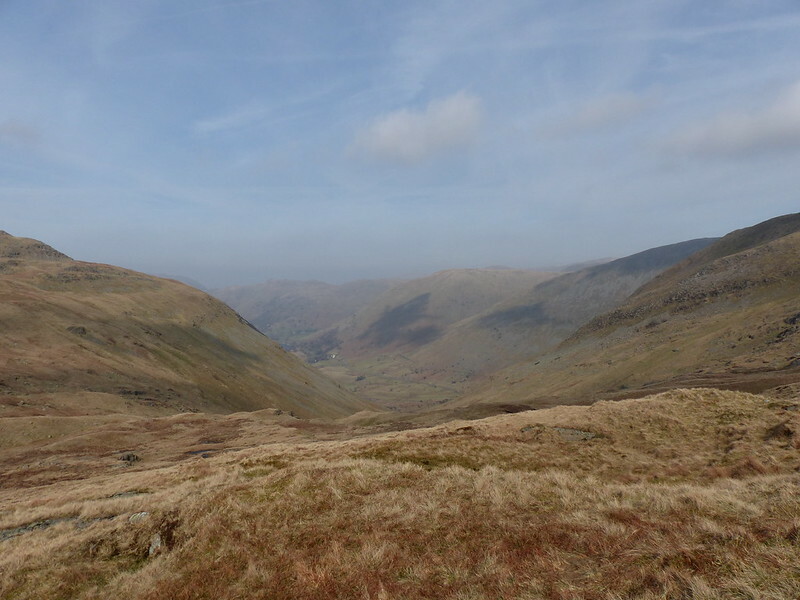 There were a few distractions to unsettle my metronomic plodding – a bitingly cold breeze, some hazy but wonderful views, and a great deal of hullabaloo from the slopes across the Caiston Glen. 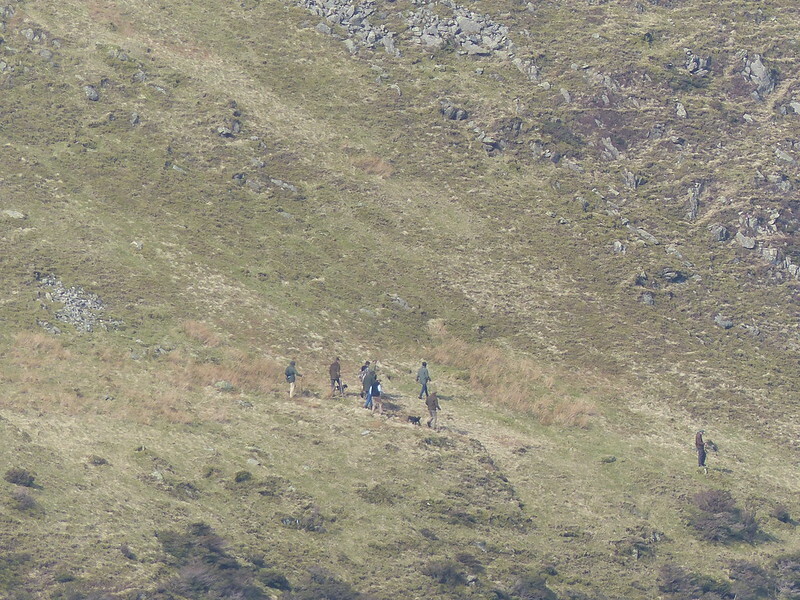 The camera’s ‘superzoom’ lived up to its name and confirmed that the noise was just what it sounded like…. I have more photos, none of them show any faces however, or any foxes. Not, I suspect, that anybody in authority would be remotely interested in pursuing a prosecution – if of course this is what it looks like it is. Step-counting: walk a hundred paces uphill. Take a breather if you need to. Do another hundred, then another. When you get to five hundred stop for a drink, or maybe sit down for a moment. These days I find the counting is enough in itself – I can judge my pace pretty well so that I rarely stop for that breather. I can remember very clearly the first time I used this approach: I was a sweltering June day and I was climbing Elidir Fawr from Nant Peris. I was with my Venture Scout unit – actually I was some way ahead of them and walking with two hill-walking friends of one of our leaders. We’d already climbed Snowdon via Crib Goch – a pretty arresting experience for us first-timers – and then taken what seemed at the time to be a suicidally steep route down into the valley. One of the grizzled veterans, I think he was called Geoff, took me in hand and got me to count steps. 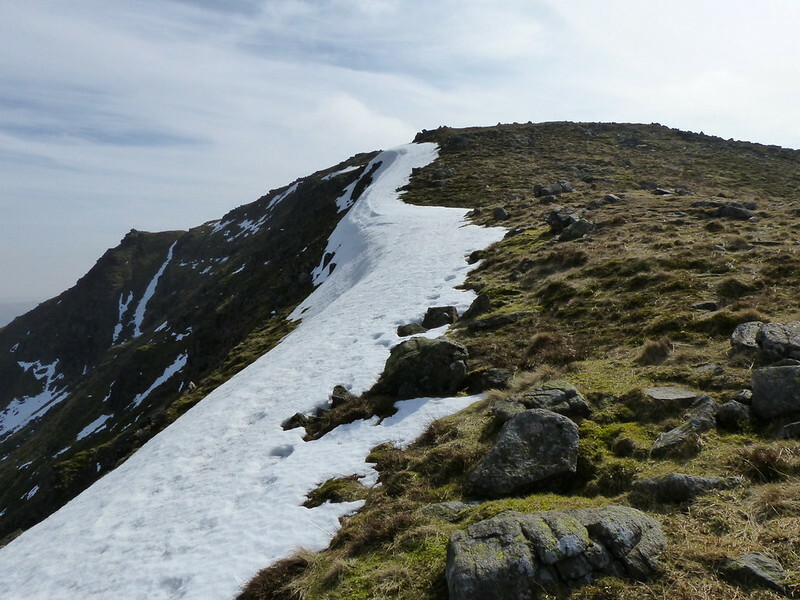 It got us on to Elidir Fawr eventually and ultimately over all of the Welsh Three-Thousand footers that day. Since then I’ve always used it for long steep slopes, but somewhere along the way the habit has become so ingrained that I find myself counting on every climb, often without consciously deciding to do so. 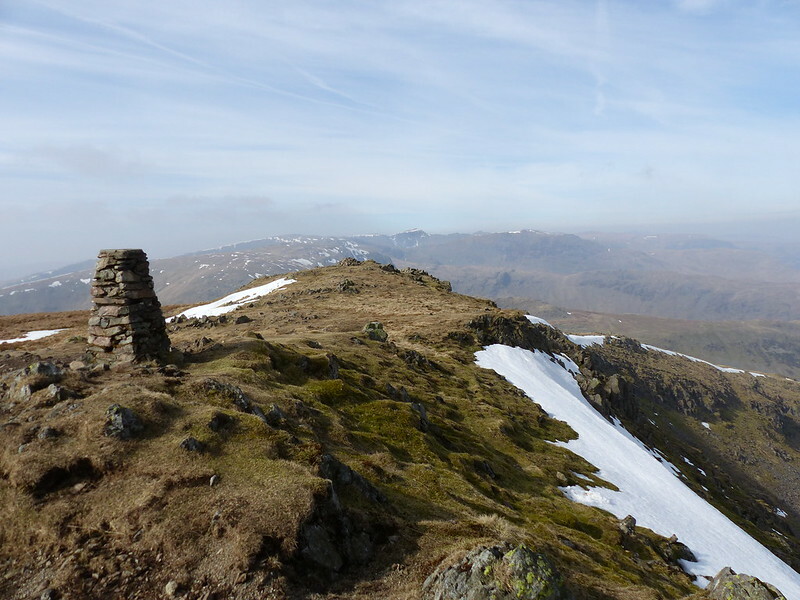 The reward for all that effort was the delightful ridge walk around to Red Screes. Counting wasn’t really necessary for that climb – but I counted anyway. 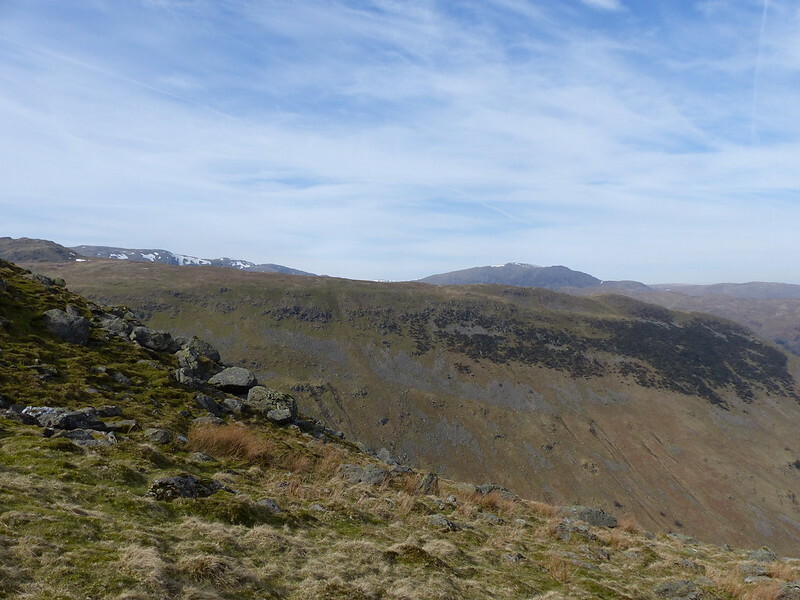 Dove Crag, Helvellyn and Saint Sunday Crag from Middle Dodd. I suppose, when I think about it, I’ve always enjoyed counting. I am a mathematician after all. Children always want to count off the steps in any tall flight of stairs – I’m just recapturing that simple pleasure. So maybe I’m leaving out the medium and mainlining the core experience. Maybe. The views were getting increasingly hazy. I know that I’m not alone in indulging in step-counting reveries. I have a little book called “The Long Road Turns to Joy: A Guide to Walking Meditation.” by the Buddhist monk Thich Nhat Hanh in which I’m sure he recommends counting steps (but also, if I remember right, counting breaths, or synchronising the two or something else which seemed far too complicated to me). 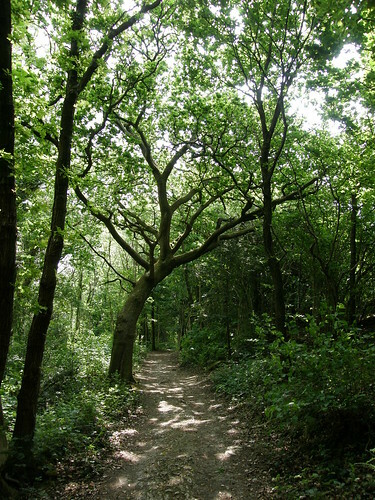 Looking down the Caiston Glen. 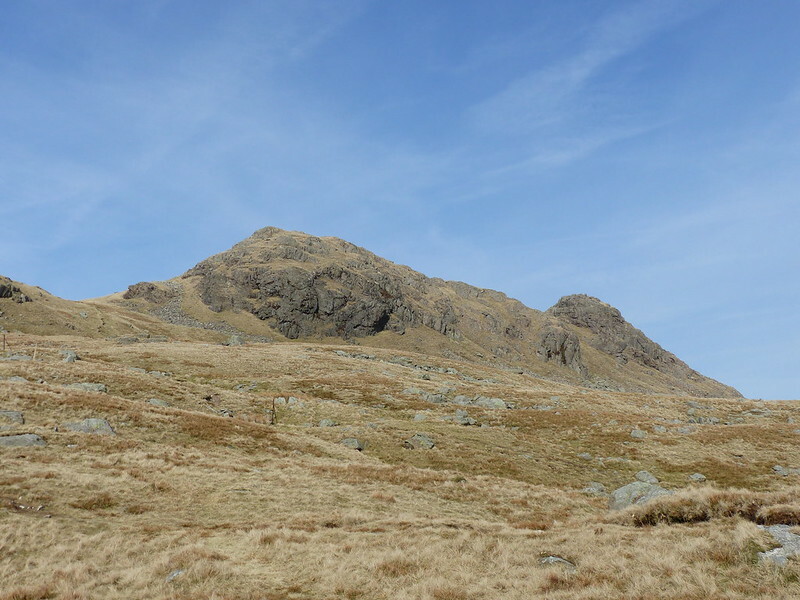 On the brief climb to Little Hart Crag I diverted ever so slightly to Scandale Tarn which struck me as a good potential spot for wild-camping. 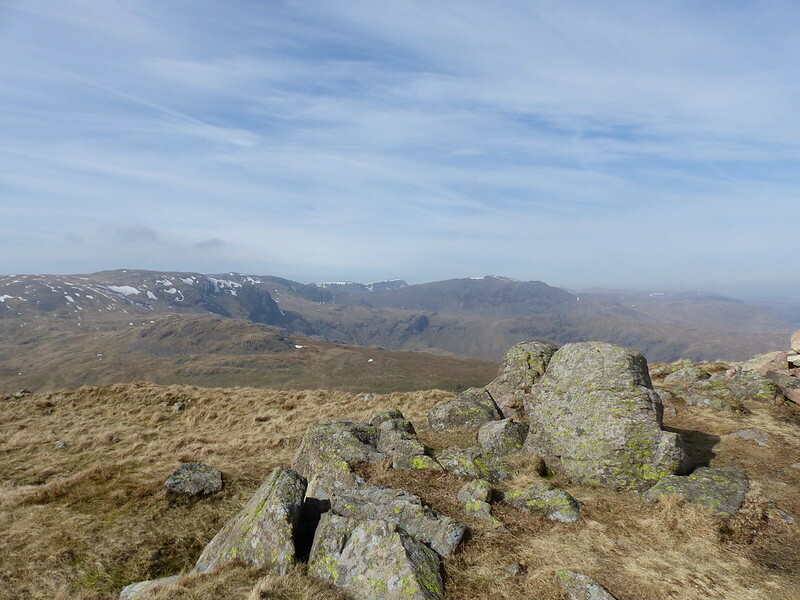 I’ve been over Little Hart Crag a number of times before, but usually on the way down from Dove Crag – which approach make Little Hart Crag seem like an afterthought and a bit insignificant, which is a shame, because it’s quite striking from this direction. So I decided to stop and fire-up the pocket-rocket again. 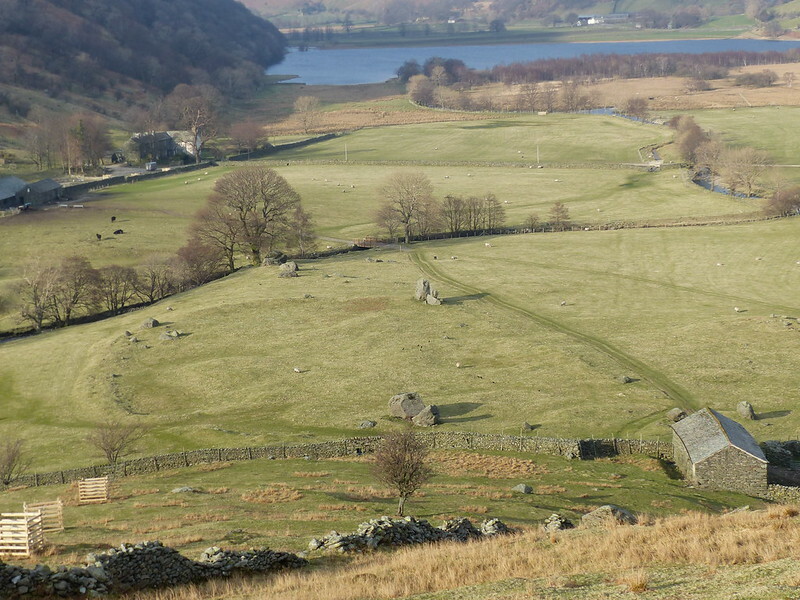 What beats a great view on a sunny afternoon in the Lakes? 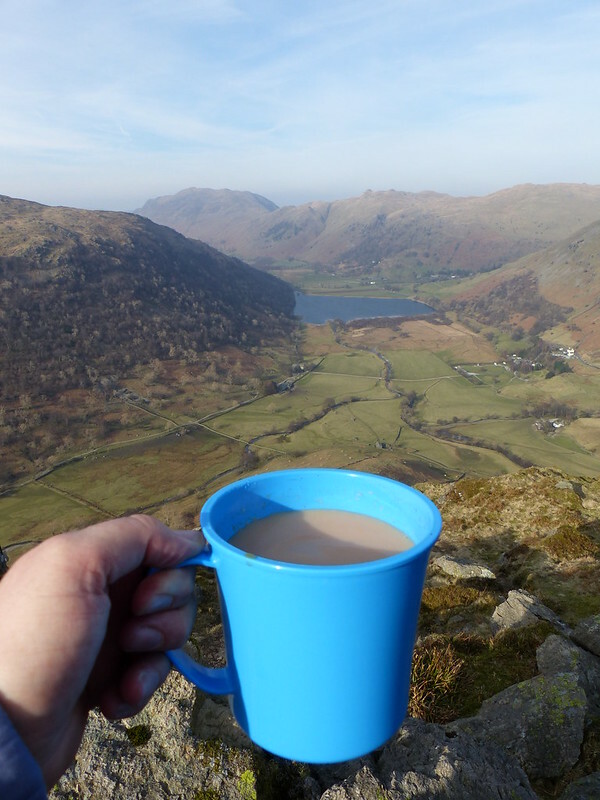 A great view on a sunny afternoon in the Lakes, with a freshly brewed cup a char! 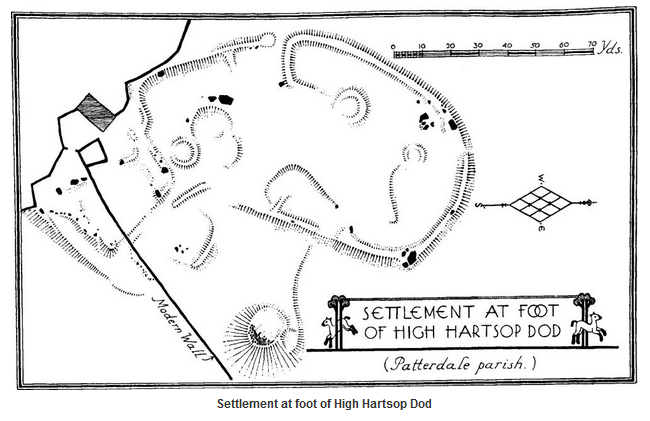 …on the British History Online website (scroll down to 61 to read a description of the settlement), but no real details. Maybe it’s A Good Thing to have one or two mysteries out there however. 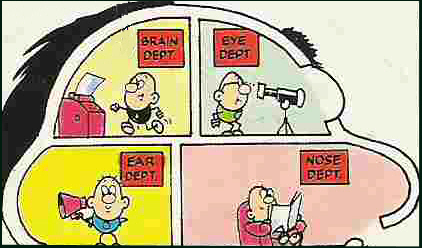 Remember the numskulls? In….the Beano or the Dandy? I have a terrible memory…. 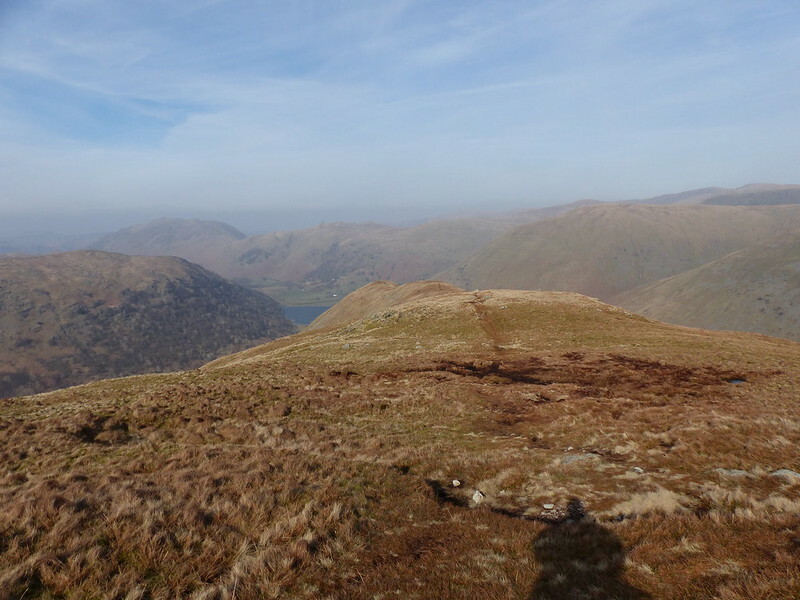 The article, stated baldly, is about how walking with a dog changed Stothert’s approach to hill-walking so that rather than following a predetermined route he simply followed the dog, and about the joys of that unplanned approach, of stravaiging. Which wasn’t quite what I was telling X-Ray about – or perhaps it was and I just didn’t realise that fact at the time. A couple of local walks from last week have passed without comment. 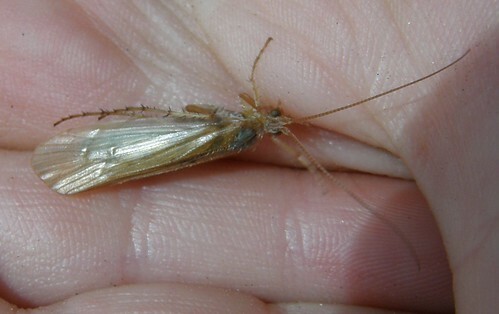 The photographs here are drawn from those outings.Firstly, an insect which B found. He is fascinated by creepy-crawlies and has a knack of finding and catching them. I have no idea what this is. During the course of our walk I bombarded X-Ray with suggestions for other routes we could be taking, or of routes nearby I’ve followed in the past. 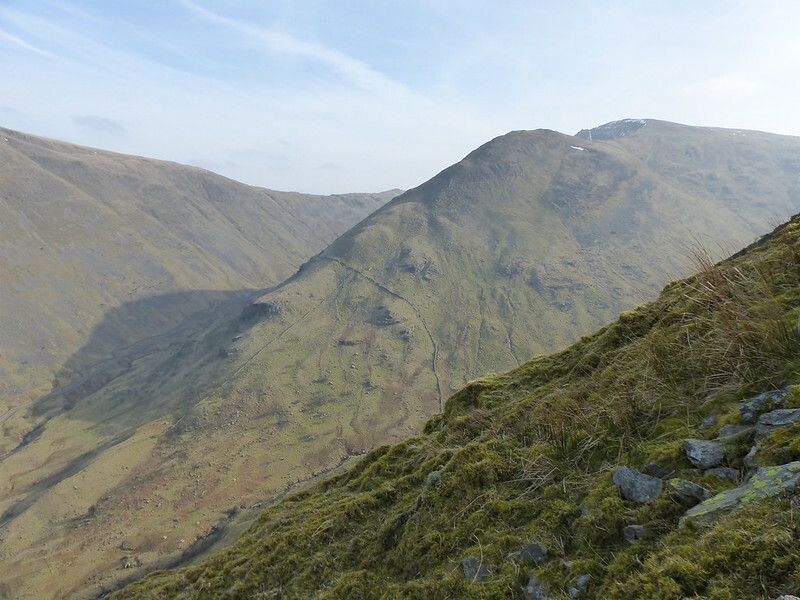 From Arnison Crag I sketched out the possibility of contouring round below Birks to Coldcove Gill, to follow the gill to Gavel Moss and then to breakout up to the left to Lord’s Seat and what looked like a rather nice ridge onto Gavel Pike. It did rain occasionally last week and I took this because of the raindrops, but then realised that I don’t know what kind of leaf this is. 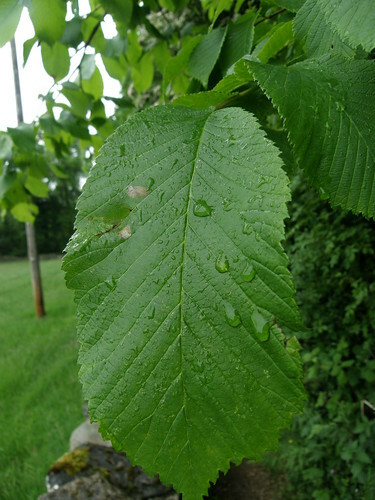 It was pretty large – too big (and too long) to be the hazel I initially took it for. 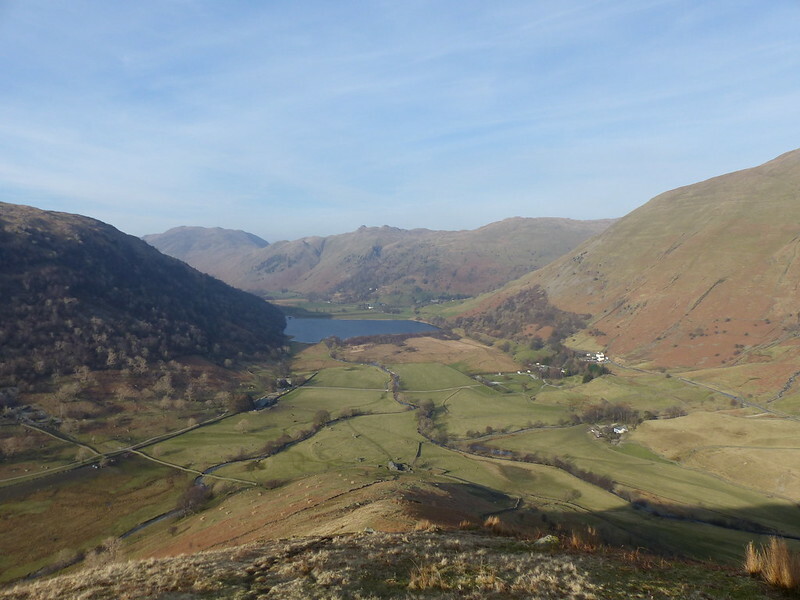 On St. Sunday Crag I regaled X-Ray with stories of wandering around Ruthwaite Cove below Nethermost Pike looking for the diminutive Hard Tarn. 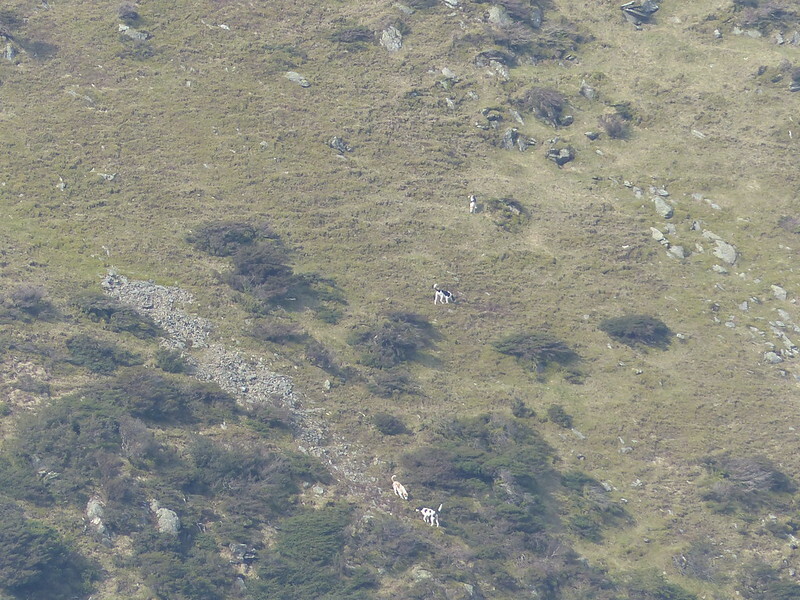 I think I told him several times about the steep climb into Link Cove below Hart Crag and the rewards for attaining that unfrequented spot. 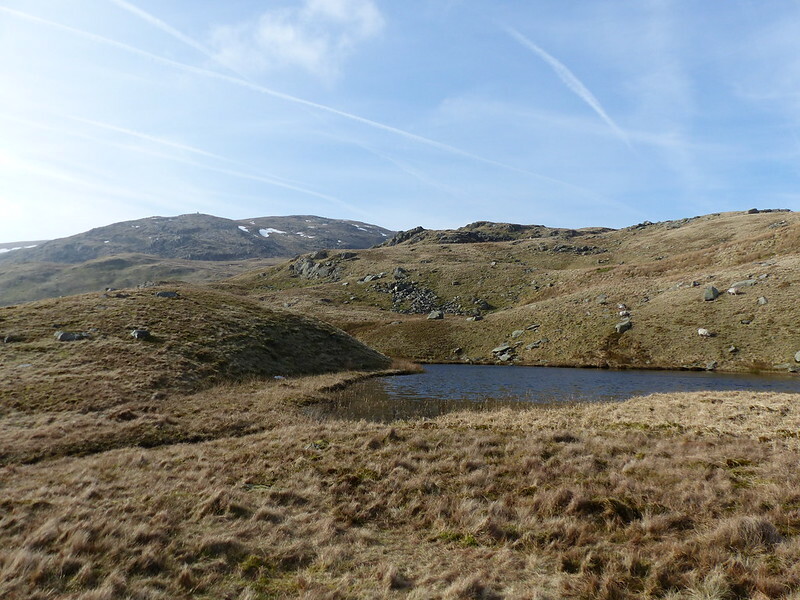 When, with a bagger’s zeal, he asked about routes onto Angle Tarn Pikes, which we could see across the valley, I advocated Angletarn Beck – “not much of a scramble, but you’ll have it all to yourself”. 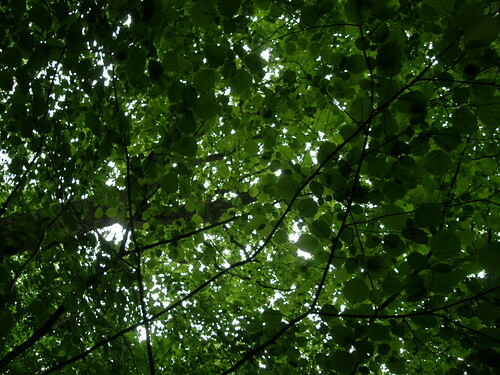 There’s a pair of jays somewhere above these hazel leaves – I could hear them, but only glimpsed them briefly. In retrospect, much as I was enjoying the walk, I think I was also kicking against the tyranny of my current obsession with list-ticking and peak-bagging. I was remembering that sometimes less is more and that maybe one hill by a ridge less travelled might be as good or better than a nine-tick day, and that the freedom to decide to abandon a planned route to follow a stream which looks promising, or to seek out a secluded tarn, is an important part of why I head into the hills. 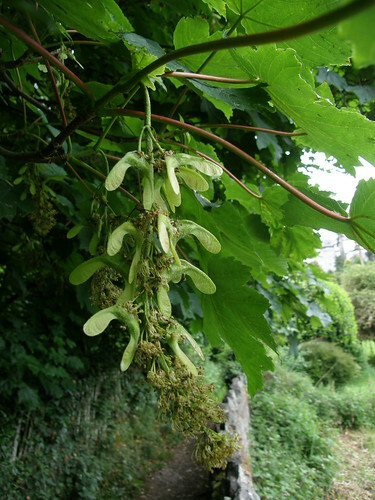 Flowers and seeds together on Sycamore. Not that I’m intend to stop ticking off the Birketts – just that I should perhaps calm down a little bit – there’s no rush. 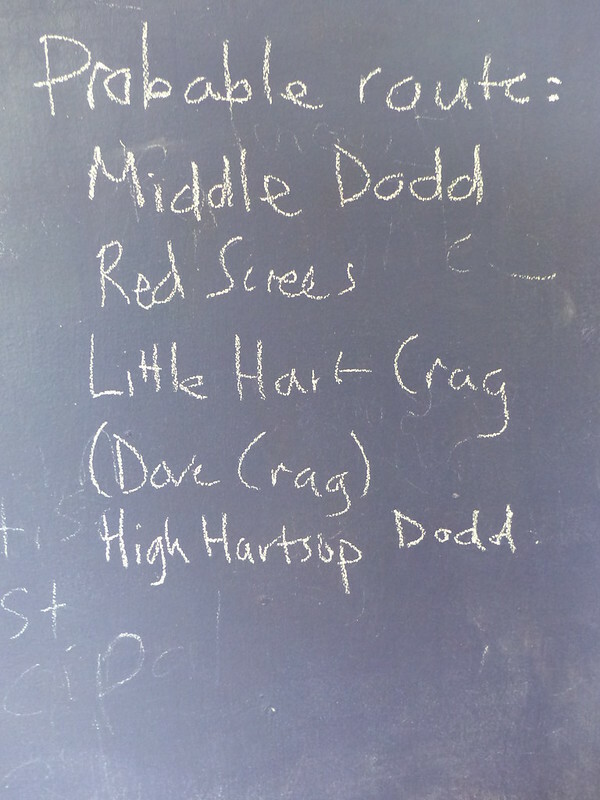 And using the list is taking me to some slightly off the beaten track spots anyway: Arnison Crag doesn’t have a major highway up it like it’s loftier, Wainwright neighbours, the long, rough mostly pathless ridge between Harter Fell and the Hardknott Pass is one I probably wouldn’t have explored but for the two Birketts along it. 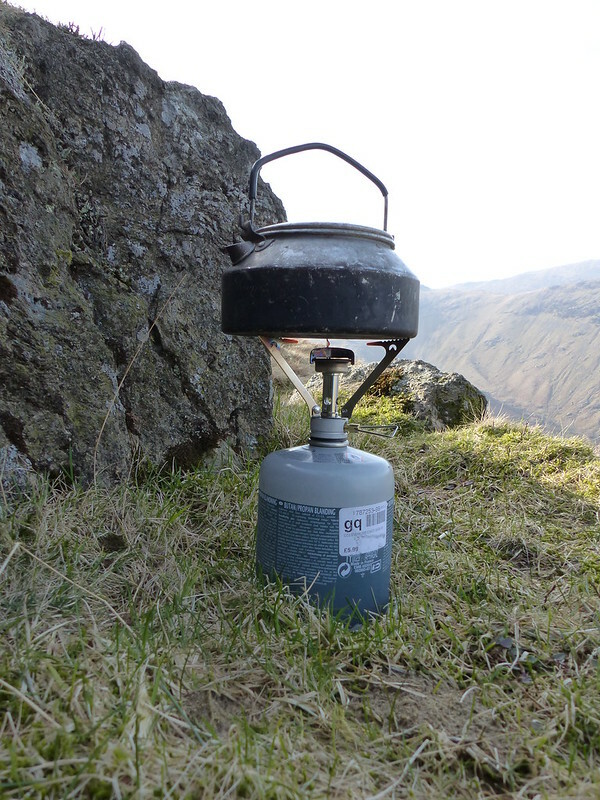 So – peak bagging with some stravaiging thrown in. Might struggle to sell that to X-Ray though, he has his own ‘minimum effort’ philosophy which doesn’t sit well with that idea. Several blogs that I read have riffed around the idea of a desire line. 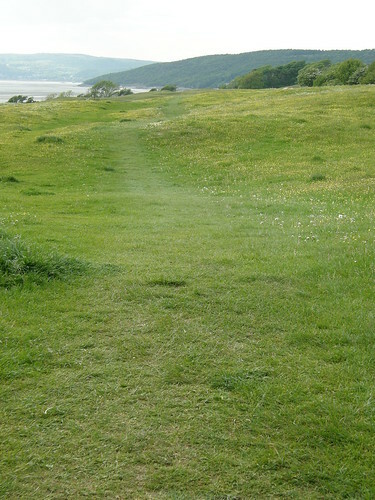 A desire line is a path developed by erosion caused by animal or human footfall. The path usually represents the shortest or most easily navigated route between an origin and destination. The width and amount of erosion of the line represents the amount of demand. They are manifested on the surface of the earth in certain cases, e.g., as dirt pathways created by people walking through a field, when the original movement by individuals helps clear a path, thereby encouraging more travel. Explorers may tread a path through foliage or grass, leaving a trail “of least resistance” for followers. I was struck by the similarity of the idea of a ‘shul’ which I came across in A Field Guide to Getting Lost by Rebecca Solnit (an anagram of lost in…? ), but which she was quoting from Buddhism Without Beliefs by Stephen Batchelor. “Emptiness” said the Tibetan philosopher Tsongkhapa, in 1397, ~is the track on which the centered person moves.” The word he uses for track is shul. This term is defined as “an impression”: a mark that remains after that which made it has passed by-a footprint, for example. In other contexts, shul is used to describe the scarred hollow in the ground where a house once stood, the channel worn through rock where a river runs in flood, the indentation in the grass where an animal slept last night. All these are shul: the impression of something that used to be there. A path is a shul because it is an impression in the ground left by the regular tread of feet, which has kept it clear of obstructions and maintained it for the use of others.